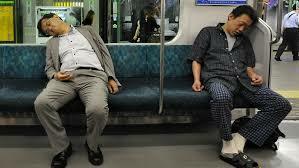 I’ve taken the train early on a Saturday morning many times. In fact, I took it every week for a year when I was going to culinary school. But I was so incredibly tired on those mornings (I was working full time as well) that I never paid attention to anything. Well, not any more than was necessary or usual. I noticed things, but didn’t pay attention. Recently, I was on an early Saturday morning train going into Manhattan, heading for the Bard Institute. I was tired but not exhausted. I paid attention. The first thing that struck me was how full the train was on a Saturday morning. Where were all these people going? Well, some people work on Saturdays. Some people go into Manhattan or downtown Brooklyn to shop. And then there are those who look like they’ve had a really long—hopefully, fun—night and are just getting back home. Many people have their eyes closed, their chins tucked into their chests, their hats pulled down low. But the ones who look like they’ve been given morphine, those are the ones you know will have a story to tell later on. Directly across from me were two young women, perhaps in their early twenties. One was draped across the lap of the other, out cold. The other, slightly butchy, two hoods wrapping her head, had her head hung low, and her mouth gaped a bit. They huddled together in a way that only lovers do. Or sisters. But they didn’t look anything alike. And it reminded me of how many years have gone by, and how quickly. My young, partying days seem so long ago, and yet it’s as if they were just yesterday. There are two schools of thought: 1) Relax and take life as it comes, and 2) never stop because life is short. As a Libra, I see the value of both sides. But as a writer, my feet are squarely on the don’t stop side. I think most other writers are too. The only way to keep getting published and stay visible in a very crowded fish barrel is to just keep writing. It seems as if until you’ve made it to a certain level, you have to swim for your life. And you know what? That gets exhausting. At the rate I’ve been going, it would be nice to slow down for a while, stretch out by the ocean, and sip a frothy blended drink. I guess I just have to figure out how to squeeze both ways into my life. Until then, I guess slowly making my way through a bottle of zinfandel during the week and having my nightly piece of chocolate will have to do. Sometimes I feel like that’s my life preserver–little indulgences that bring me some serenity. A life preserver, if you will. I’ve also taken to adult coloring books. 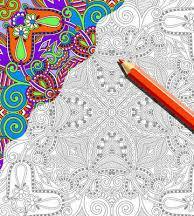 There’s something about coloring that’s really calming. You’re so focused on your flower or dragon or psychedelic pattern that your mind just shuts everything else out automatically. Before you know it, you’ve experienced a few moments of peace. And that’s better than nothing. It’s Friday as I write this, and my wine glasses are clean. I’m going to use one tonight. I’m also busting out a new bar of Ghiardelli’s dark chocolate with sea salt and I’m starting a fresh page in my flowers of the world coloring book. 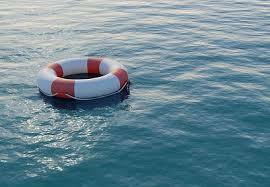 Here’s to you finding your life preserver. Next Post Happy Friday the 13th! Do you use pencils or markers? 🙂 My coloring book is one sided so I can use markers.